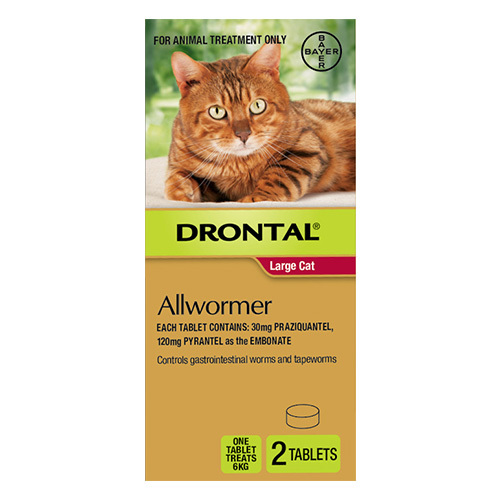 Drontal for cats is a broad spectrum Allwormer tablet for killing and controlling intestinal worms in cats. The tablet used as a single treatment treats tapeworm, hookworm and roundworm infections in kittens and cats. Drontal tablets consist of praziquantel, febantel and pyrantel embonate as the active ingredients. All of them have anthelmintic properties that kill different intestinal parasites. Praziquantel disintegrates the worm by damaging its skin internally. Pyrantel pamoate causes paralysis to the worm. This forces the worm to lose grip on the intestinal walls of the cat. 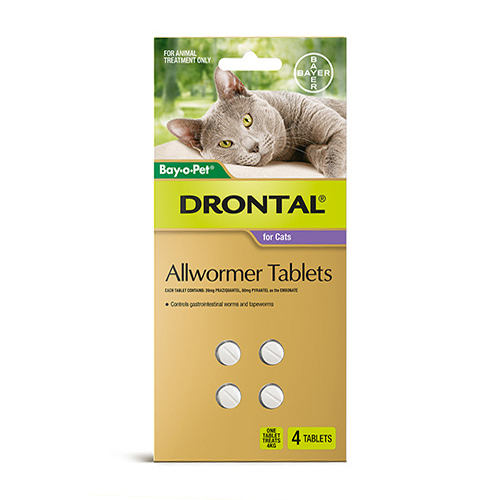 Drontal tablets are available in two packs – Drontal for cats upto 4 kg and Drontal for large cats above 4 kg. Weigh your pet and choose the relevant pack. Check dosage table for details. Administer the tablet directly in the mouth. If the pet does not take tablet directly, then break it into pieces and mix with her food. Consult your vet for further details about administering the tablets. Do not give to kittens that are younger than 2 weeks of age and weigh less than 1.5 lbs. Do not administer to pets allergic to any of the ingredients of Drontal for cats. Side effects are rare but may occur to hypersensitive pets. Vomiting, diarrhea, appetite loss, excessive salivation are some of the common adverse effects. Consult a vet if any of these symptoms are observed. Do not club it with any other deworming treatment. Ask a vet before doing so. Follow label instructions for expiry, administration and other details. Consult a vet before treating convalescing, pregnant and lactating pets. Human ingestion may prove toxic. Contact the nearest poison control center if such case arises. Do not give Drontal tablets to kittens younger than one month old and weigh less than 1.5 lbs. It was recommended by a friend who also happens to be a vet. Must say, the product is very effective against worm infections. My kitty loves these chews which has made the deworming process all the more easier. I got this product at a never-seen-before price from VetSupply which makes me even happier!!! Thank you so much!!! My veterinarian recommended this treatment for my two outdoor kitties. It is much easier to give this pill to my cats. It is quite effective in getting rid of worms from my feline and keeping her fit and healthy. My kitty was suffering from the intestinal worms. I took my cat to the vet and he prescribed me this product to use on my furry pal. It is easy to use and works well. I am happy to see my furry pal improving in her health after giving this treatment.